Tell us about why you're involved with Girl Scouts. We know your goddaughter is a Girl Scout, but what else about the organization makes it personal? "Today is her birthday! She’s turning nine. She’s doing her bridging ceremony on Friday, so she’s becoming a Girl Scout from a Brownie and changing her vest for her sash, so it’s a really big deal,” says Liu. “I love their work with the community and that they give back, because when you’re that young you’re really learning what it means to share and what it means to give back. I didn’t really learn that until much later, you know after I started working and people started inviting me to go to charity events and dinners for different organizations." 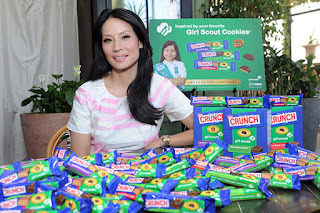 Lucy Liu is an American actress, model, artist, and occasional film producer.